[November 19, 2012] Mass die-offs resulting from human impact and the planetary response to the anthropogenic assault could occur by early 2016. A massive storm system hammered southern Queensland with destructive, near hurricane force wind gusts as 4-inch hail and heavy rain buffeted the region. The storms affected the Brisbane, Ipswich, Sunshine and Lockyer council areas, causing crop damage in the Granite Belt and on the Darling Downs, reports said. The storms caught the country’s Bureau of Meteorology (BoM) by surprise, as they failed to issue a specific warning until after the extreme weather event had hit parts of Brisbane. Brisbane city received about 80mm of rain, and rainfall in access of 100mm was recorded elsewhere in the region over the weekend. 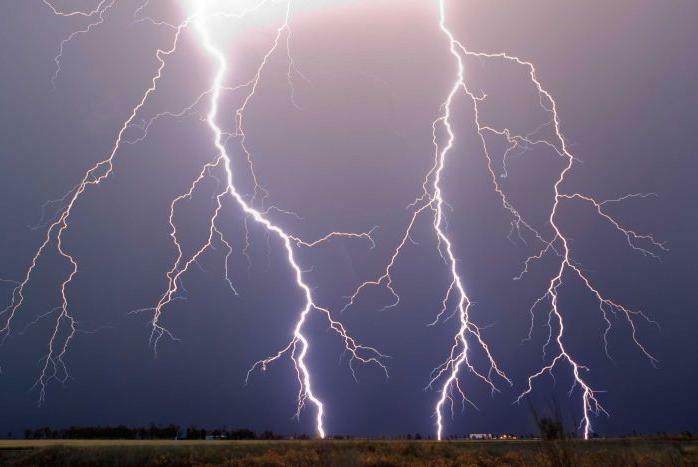 At least 100,000 bolts of lightning, delivering an estimated 50 megacoulombs of electric charge, were recorded in the region. [October 1, 2012] Mass die-offs resulting from human impact and the planetary response to the anthropogenic assault could occur by early 2016. More than 4,500 West Nile virus infections and 169 deaths reported in 47 states and D.C.
Alabama, Arizona, Arkansas, California, Colorado, Connecticut, Delaware, District of Columbia, Florida, Georgia, Idaho, Illinois, Indiana, Iowa, Kansas, Kentucky, Louisiana, Maryland, Massachusetts, Michigan, Minnesota, Mississippi, Missouri, Montana, Nebraska, Nevada, New Hampshire, New Jersey, New Mexico, New York, North Carolina, North Dakota, Ohio, Oklahoma, Oregon, Pennsylvania, Rhode Island, South Carolina, South Dakota, Tennessee, Texas, Utah, Vermont, Virginia, Washington, West Virginia, Wisconsin, and Wyoming. As of October 1, 2012, a total of 47 states and D.C. have reported West Nile virus infections in people, birds, or mosquitoes. At least four thousand five hundred (4,500) human West Nile virus infections including 169 deaths [numbers to be confirmed] have occurred, so far this year. The reported WNV cases include 51% neuroinvasive disease cases (such as meningitis or encephalitis). 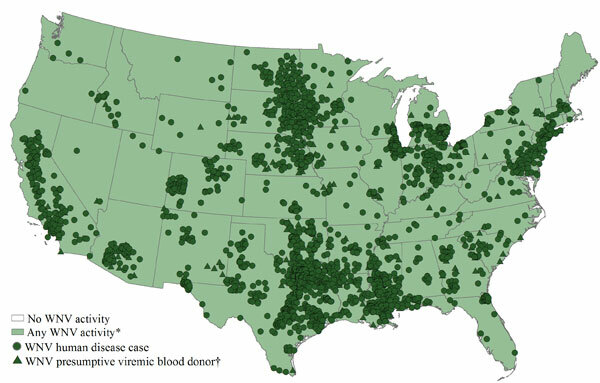 Footnote: The map displays white areas that represent no WNV activity reported, light green areas that represent any WNV activity* , dark green circles that represent disease cases, and dark green triangles that represent presumptive viremic blood donors. * Includes WNV human disease cases, presumptive viremic blood donors, veterinary disease cases and infections in mosquitoes, birds, and sentinel animals. † Presumptive viremic blood donors have a positive screening test which has not necessarily been confirmed. [September 18, 2012] Mass die-offs resulting from human impact and the planetary response to the anthropogenic assault could occur by early 2016. Monsoon rains have left about 1,000 people killed or injured, destroying more than 15,000 homes, and damaging thousands more, across Pakistan since August 22. As of September 18, 2012, 48 states have reported West Nile virus infections in people, birds, or mosquitoes. At least three thousand five hundred and seven human West Nile virus infections including 134 deaths [to be confirmed] have been reported to CDC ArboNET from Alabama, Arizona, Arkansas, California, Colorado, Connecticut, Delaware, District of Columbia, Florida, Georgia, Idaho, Illinois, Indiana, Iowa, Kansas, Kentucky, Louisiana, Maryland, Massachusetts, Michigan, Minnesota, Mississippi, Missouri, Montana, Nebraska, Nevada, New Hampshire, New Jersey, New Mexico, New York, North Carolina, North Dakota, Ohio, Oklahoma, Oregon, Pennsylvania, Rhode Island, South Carolina, South Dakota, Tennessee, Texas, Utah, Virginia, Washington, West Virginia, Wisconsin, and Wyoming. Map shows the distribution of WNV activity* (shaded in light green), human infections (dark green circles), and presumptive viremic blood donors (dark green triangles) occurring during 2012 by state. If West Nile virus infection is reported from any area of a state, that entire state is shaded.